Ape Out doesn’t ask how high can you climb, but how hard can you hit? It’s no coincidence games ask you to wear headphones while playing for the optimal experience. Sound has always been such an important part of the gaming experience. The iconic background music which introduced us to Super Mario Bros. The sound Sonic makes when collecting a ring. The pulse-pounding score that accompanies the brutality of Hotline Miami. That last one is quite pertinent to this review as Ape Out definitely takes some inspiration from the 80s slugger with its intense palette changes and graphic smatters of blood. But every punch contributes to the soundtrack with powerful symbol crashes and thumping drum smashes. It sends the heart rate racing, for sure. And make no mistake, this is one intense experience. Because there’s no guns to pick up and start shooting with. No armor packs to wear and deflect flying bullets. You’re just an angry ape who’s been imprisoned for far too long. Breaking out of your cage, now you’re running amok, smashing and crashing through everything in sight, all while in your birthday suit. The whole point is to get up in your enemies face and slam your fists into them so hard they splat against the nearest wall. Or you can grab them and use them as a human shield that also fires the occassional bullet for you. All in a bid to reach the end of the level and move onto the next. Hoping the next leap will be the leap home … or something. Most games have trained us to stay as far back as possible, peppering enemies with headshots and body blows. 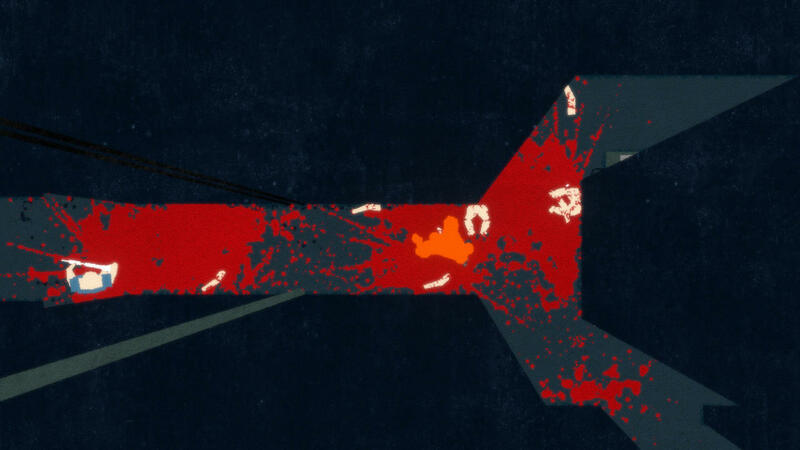 Ape Out gives you a choice – either be close enough to pound your attacker into mush, or run away as far and as fast as you can using the environment for cover. Just because you’re a big hulking ape who could give Kong himself a scare, doesn’t mean you can’t get hurt. The guards are lethal shots, and they come in all different types – Snipers, Bombers, Rocketeers, and Shotgunners to name a few. They are frighteningly accurate and if you give them enough chance to line up a shot, it’s going to leave a mark. Our Ape friend can take up to three shots max, though it depends on the kind of damage inflicted. For instance, if you’re stood too close to a bomber and a wall and you decide to hit them, the resulting explosion will immediately kill you. Alternatively, that can work to your advantage if you hit a bomber towards approaching enemies. It can be a game of strategy, at times. If you have been shot, the Ape will leave a trail of blood behind it, coating the floor in a luminous life essence trail that matches its own fur and flamboyance. Unsurprisingly, this can also work against the Ape as it makes it even easier for his attackers to track right to its position. For a game with such simple mechanics, there’s a surprising amount of things to think about. That also goes for its artistic direction and its stylistic approach. Sometimes levels will see you wander corridors in pitch black conditions with only torchlights revealing where your enemies are located. Sometimes sound will play a key role in revealing where an enemy is in relation to you. The thing that most impressed me, though, are the changes to the colour palette, used to represent the Ape in each setting and the way title cards are displayed on screen, sometimes using large letters which encompass the entire layout, sometimes small words popping up all over the screen, populating in time with the music. 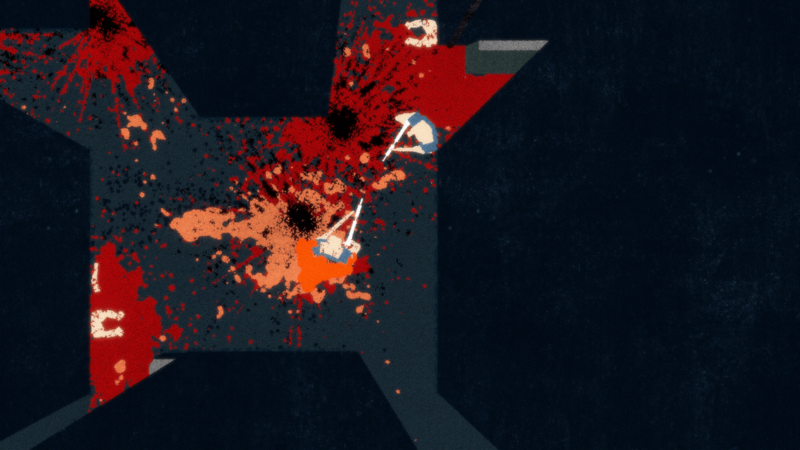 Ape Out feels like a proper arthouse independent experience. There’s a clear premise, even if the story is full of blanks. The aesthetical touches are pleasing and enriching, purposefully designed to stay in tone with the game. And on a mechanical level, it’s really satisfying, arguably more so than games its taken inspiration from. There were frustrations. Not least of which the difficulty level can be harsh at times, and the procedurally generated variant levels mean there’s no guarantee your next spawn will take it any easier on you. Control wise, I also found that the punch sometimes ‘swung and missed’ even if I was in range and at the right angle to my enemy. And because there’s a delay between each strike, this often left me quite vulnerable and exposed, especially as you’ve got nothing to defend yourself with. 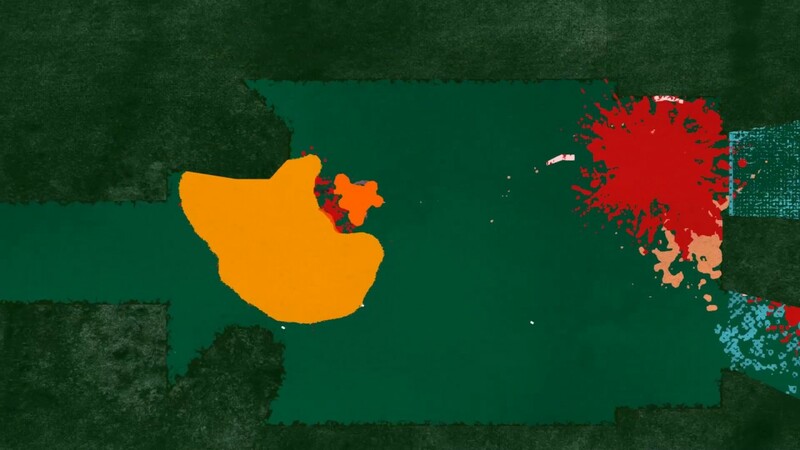 But Ape Out is a very special, surprisingly wonderful, downright brutal game. It has a dash of everything and amazingly keeps itself fresh throughout by introducing the seemingly bare amount of change. Devolver Digital’s eye for indies never ceases to amaze, they’ve got yet another hit on their hands, one that splatters the imagination to leave a lasting impression.